With a software-only WWDC behind us, rumors of next-generation iPhone hardware are back at full speed. According to a credible source, the next iPhone has reached final testing stages, which suggests that a release might be imminent. According to the source, the next iPhone is currently in "AP" stage, which means that near-final prototypes are now being passed around Apple and carrier executives in order to figure out some last-minute problems, if any are found. That’s no surprise, since in order to have the device announced in two months time, mass production will have to begin really soon. Apple and Verizon have yet to strike a deal regarding FaceTime over 3G for the Verizon network. Keep in mind that 3G and 4G aren’t the same thing. If you’ve been reading this blog over the last few days, you’re probably aware that the latest beta of iOS 5 supports FaceTime calls over 3G, despite the load that feature would place on cell networks. Maybe 4G access would make FaceTime conversations possible, although most indicators suggest that we won’t see a 4G-capable iPhone before 2012. The only plausible theory is that FaceTime will only work over AT&T (and Wi-Fi) until a 4G iPhone is released sometime next year. According to this source, Verizon isn’t too keen on over-the-air updates either, presumably due to bandwidth constraints, although AT&T’s willingness to do it (at least as far as we know) will leave Verizon at a competitive disadvantage. Hopefully Verizon will realize that before the phone launches: if not, their loss. The current iPhone 4, arrived at the Verizon network earlier this year, works fine with a caveat: it doesn’t allow data connections (such as web browsing) during calls. Unless FaceTime and over-the-air updates are fully supported on the carrier, Verizon iPhone users will become second-class citizens, forbidden from taking advantage of iOS 5’s full potential. 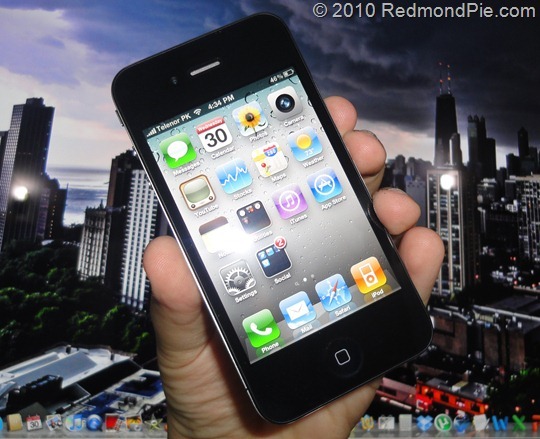 The next iPhone is expected to look identical to the iPhone 4, only with enhanced hardware, such as a new processor. Reports have also pointed to a larger 8-megapixel camera, instead of the iPhone 4’s 5-megapixel one. A leaked picture, allegedly depicting the next iPhone’s back plate, confirms that, since the plate looks identical to the one present on the current iPhone, aside from the placement of the camera holes. While 4G support on the next iPhone is very unlikely, this report confirms once again that the release of a future iPhone is almost confirmed for September this year. Don’t be fooled by the unlocked iPhones, which should arrive in Apple Stores on Wednesday.